Join the Bar-Bill Club and get your own personal mug (with your name on it). A dollar buys you a draft beer and a couple more will get you any drink of your choice at a discount. When owner Joe Giafaglione created the club, he had few members to start. The number now stretches above 4000 and continues to climb. In 2011, Joe retired and sold the bar to his niece and her husband. Clark and Katie Crook run the bar with their sons John and Harry along with manager Joe Morcelle, truly keeping it a family affair. This ideology definitely continues the enduring comfort and endearing value that Joe created in the 1970s. If you haven't had the chance to experience the Bar-Bill yet, come down and visit. 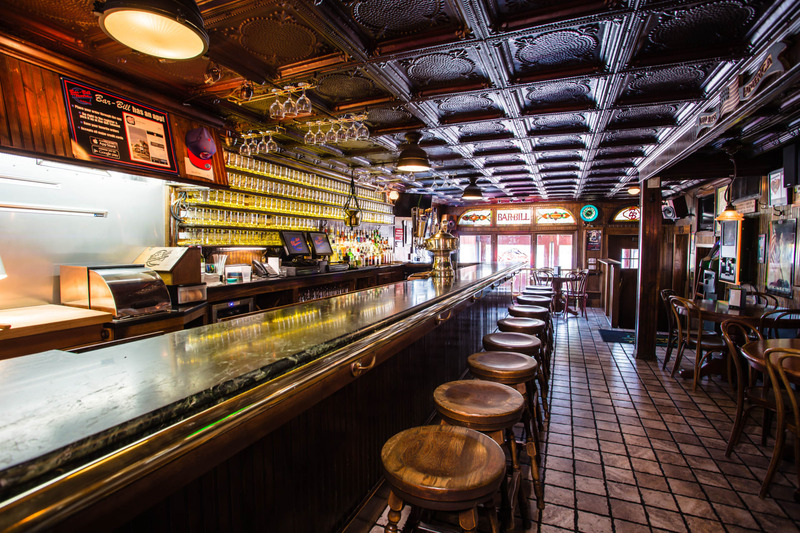 We would love to show you the bar we love. No frills, no pretense, just a place to meet your old friends and make some new ones. 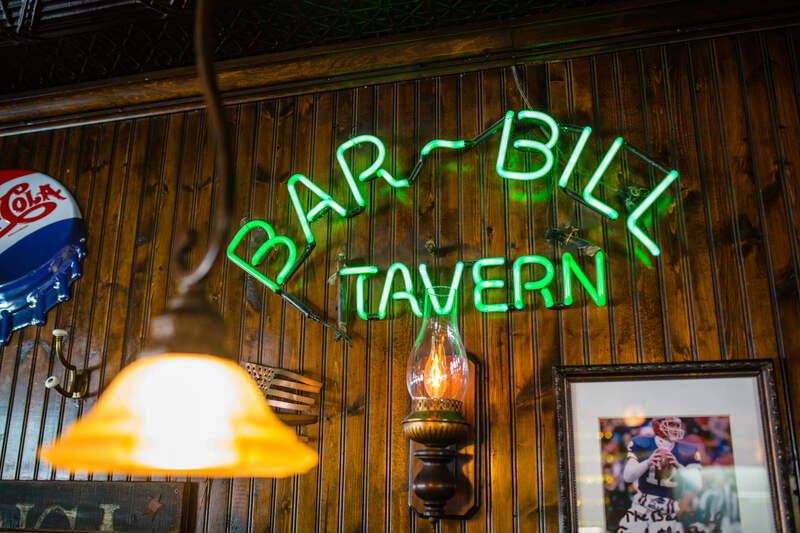 The Bar Bill Tavern has been an institution in East Aurora, NY since the day it opened its doors. Mystery surrounds the lore of "the Bill" at almost every telling. Everything from the name, to the famous customer vacations to the mug club feature a level of mythology when told at the bar (and elsewhere). The old building at 185 Main Street has stood for over 150 years. Originally opened by Barb and Bill (hence the name) Korzelius, the tavern replaced a small Ice Cream shop on the west end of Main St. The bar featured Beef on Weck as it's only food option, as well as a limited drink list. 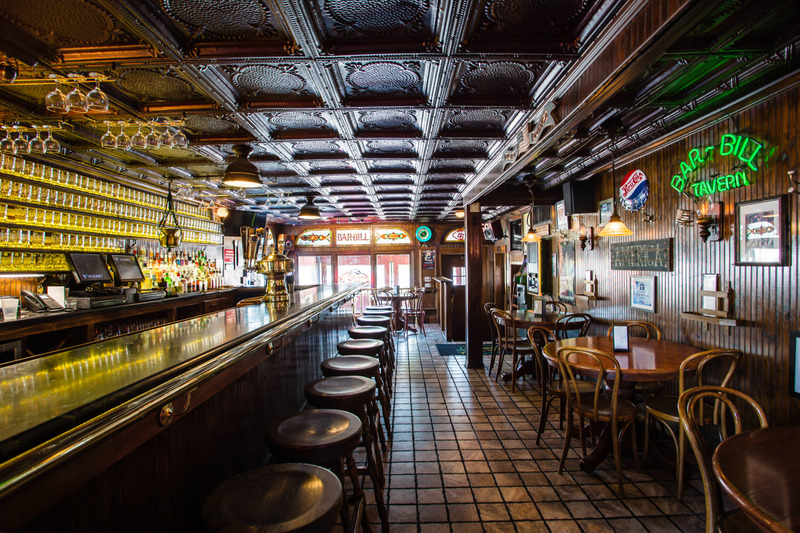 When Joe Giafaglione bought the bar in 1977, he had much bigger plans. Joe, a former engineer at Bell Aerospace, decided that corporate life wasn't for him. When he heard that the bar was being put up for sale, he jumped at the opportunity. Within a year or two, Joe introduced what would become an integral part of the Bar Bill experience, the mug club. For a nominal fee, patrons would receive a custom printed mug including the name of their choosing and their mugs chronological number. The first order included 20 mugs and filled one small shelf behind the bar. The club now boasts more than 4000 members and rising, with most of the mugs still residing in the small bar. In 1983 Joe opened his kitchen, serving chicken wings along with the beef. He developed his now world famous sauces in the tiny kitchen as he worked. 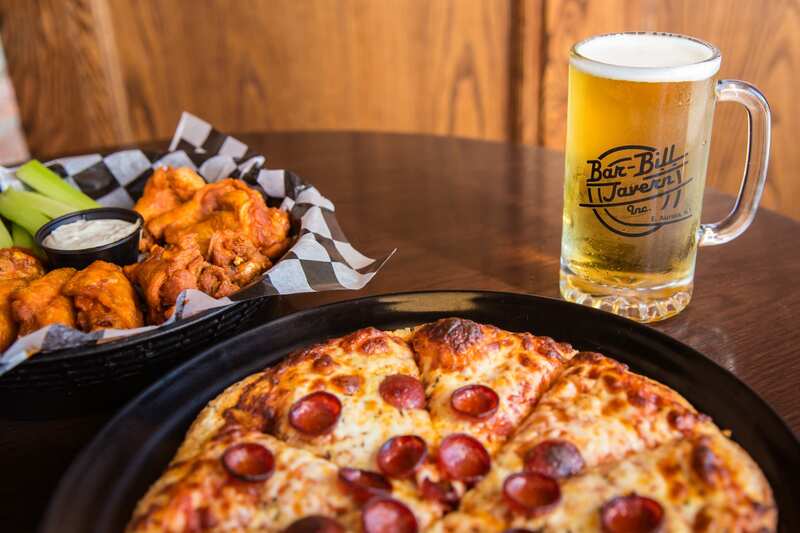 Joe would very quickly transform the bars reputation from rugged watering hole to one of the city's best, topping many "best wings" lists throughout the area. Today, thousands of people from every walk of life come to see for themselves if the wings live up to their reputation. Actors, NFL Players, and Local Celebrities sit among bar regulars and enjoy wings and a few drinks together. 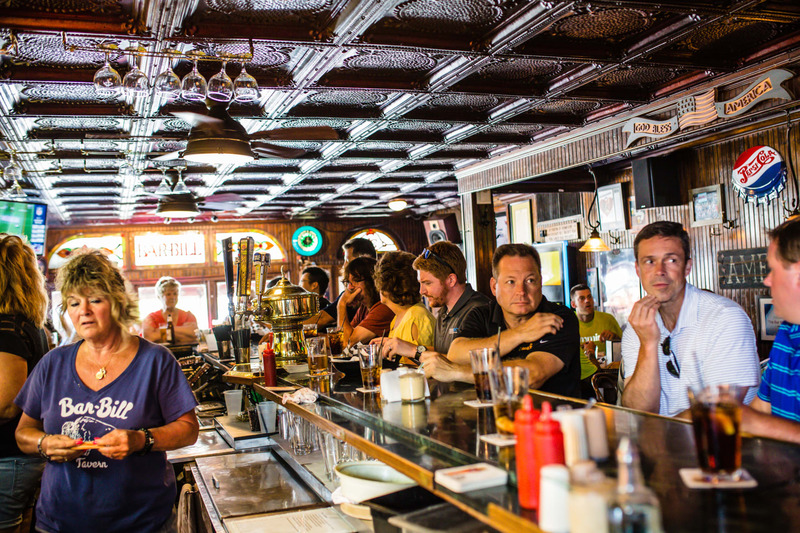 Another famous part of the bar's history is its customer appreciation. Joe began the tradition with massive parties in the area with live music, food and drink and entertainment. This eventually led to a vacation in Syracuse to see a concert with his staff and regular customers. So much fun was had that they decided to go on a full fledge vacation to the Caribbean. Every customer pitched in a little money, and they all enjoyed an all-inclusive beach getaway. Joe now claims that they've gone on so many trips to date that they've hit every island in the Caribbean and more. In 2011, Joe made the decision to retire after 35 years at the bar. He found a buyer in his niece Katie and her husband Clark Crook. The pair now runs the bar with their sons John and Harry along with manager Joe Morcelle, keeping the business in the family. The Bar Bill continues to be filled with new comers, old friends and a dedicated staff. To get a table or your name on the list, talk to our bartenders. They’ll be happy to get you a drink while you wait. So, making that call won’t improve your odds. The best way to ensure you get a table is to come early, or come during slow times (usually from 2:00 PM to 4:00 PM). So, coming with cash always makes for an easier transaction. We have an ATM located in the bar if you forget, so you’re never totally stuck. Make sure you get at least one order of wings to share. You will not be disappointed, they’re world famous! And we only serve beef ’til 10pm. So get there early! 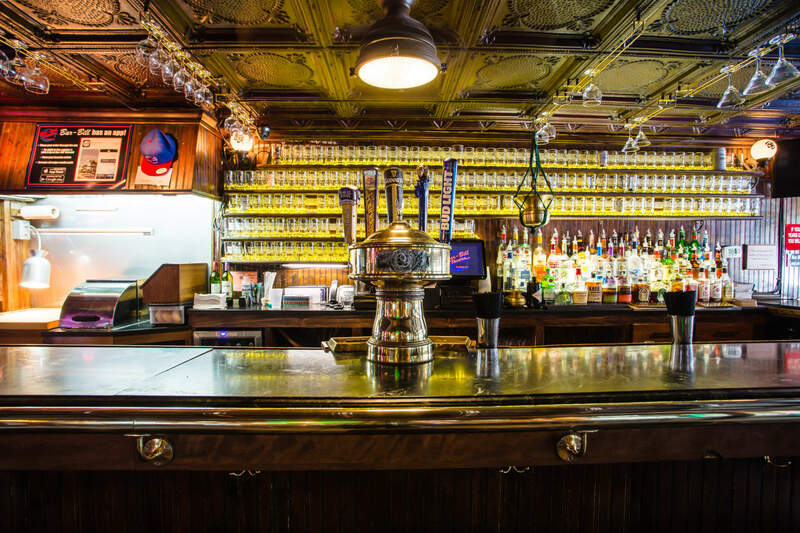 If you’re a draft beer drinker, order a mug from the Bar-Bill Club. For $50 you’ll receive a custom printed mug that gets you drink specials at every visit (including $1 draft beer). The thing to remember above all else is you will always have fun with the right attitude. Dinner hours will almost always have a wait, but that doesn’t mean you can’t have some drinks, watch a game, listen to the jukebox or just relax. First timers should also prepare themselves to have a new favorite place!